RAMP home modification program provides an experienced specialist to visit your home and develop a design plan with the goal of helping you function safely and independently in your living space. At RAMP, we design modifications to the highest standards of function, safety and aesthetic appeal. If you need to modify an existing home or apartment or are moving to a new location, our specialists can meet with your contractor to develop a plan to meet your requirements prior to construction. Contact our center at (702) 538-8743 (Let Us Help) and arrange for an appointment with a consultation specialist. Typical appointments last approximately one hour. After a thorough assessment, you will be provided with a report of recommendations to increase the accessibility, mobility and safety in your home. A skilled, RAMP home modification specialist can be scheduled to complete the project or our consultant can work directly with your contractor. Our specialists will provide pricing and if requested, funding information. Gerald Valovic, a senior in the Las Vegas valley, will soon be regaining his independence after a serious injury thanks to Nevada Senior Services’ RAMP (Renovate-Accessible-Mobility-Prevention), a new home safety modification program for seniors and LOWE’S Heroes Volunteer Program at the Lowes store at 7550 W Washington, Las Vegas, NV 89128. In January of 2013, Mr. Valovic was making repairs to the roof of his home when a serious fall occurred. He had surgery to repair several crushed vertebrae and has been in a hospital or rehab for nearly nine months. Desperate to return to his home, he inquired about getting a ramp to accommodate his wheelchair and found out that the price was prohibitive for his disability income. 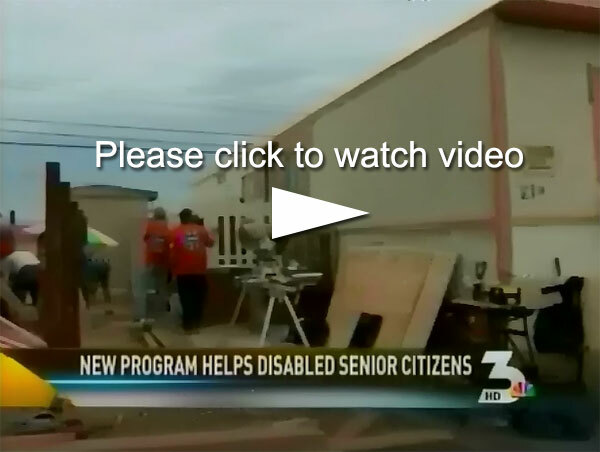 The State of Nevada Aging and Disability Services Division recently awarded Nevada Senior Services a grant to assist with the huge demand for vulnerable, low income seniors who are in need of home safety modifications. The services include installation of grab bars, hand-held shower heads, stair handrails, adaptable faucets, simple ramps and other essential repairs and adjustments. Mr. Valovic’s ramp project is not a basic installation and would require a huge amount of funding. Lowe’s Heroes came to the rescue. RAMP’s Home Modification Specialist, Tim Rabatsky and Nevada Senior Services’ Director of Professional Services, Christine Terry met with Joe “The Pro” Screnci, a sales specialist at Lowes and coordinator of the store’s Heroes Program. Lowes agreed to participate in the project by donating the majority of the materials and a team of the Washington store’s “Hero” volunteers to complete the project in one day. Valovic was overwhelmed by the two organizations generosity and cannot wait to wheel himself out of his trailer home and begin his life anew with dignity and independence.